Summary: The City of Marco Island's Marine Turtle Conservation Education Outreach Program (OUTREACH) is designed to promote conservation and protection of the Loggerhead Sea Turtle population that uses Marco Island coastal waters and nests on the approximately 7 miles of beaches. This OUTREACH will target permanent residents, including school aged children, as well as seasonal residents and tourists, by creating signage with educational information and State and local regulations to be posted at two recently constructed City public beach accesses. The message of all OUTREACH material will provide sea turtle facts, rules and contact information. Results: Design of sign to promote conservation and protection of the Loggerhead Sea Turtle population that uses Marco Island coastal waters and nests on the approximately seven 97) miles of beaches. 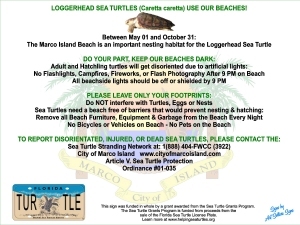 The sign has educational information including State and local regulations, sea turtle facts and contact information. The signs will be 3 feet by 4 feet in size and installed on two poles at the dune crossover boardwalk at each of the City’s two public accesses. An article in the local newspaper announced the installment of the signs. Sign creation and delivery was not on schedule but was up in time for the start of the sea turtle nesting season.